The Speech Wizard Launches Their First App – “Articulation with The Speech Wizard”! CAMARILLO, CA (April 26, 2014) – The Speech Wizard is pleased to announce their first app- Articulationwith The Speech Wizard to be released for the iPad in May 2014. This is the first of many innovative and interactive apps intended for speech and language therapy. 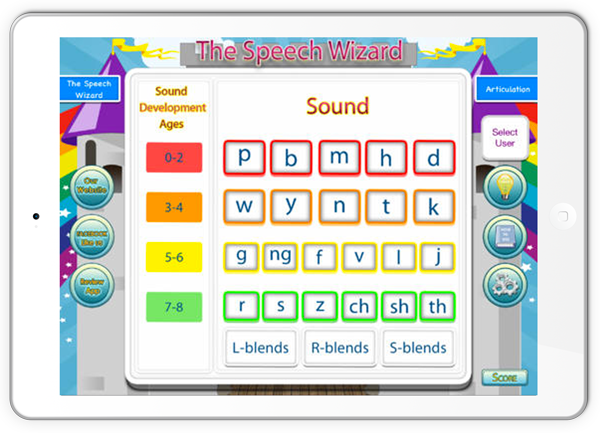 Articulation with The Speech Wizard app includes a variety of activities for: increasing speech clarity, assisting late talkers, children with speech delays/disorders, auditory discrimination delays/disorders, and phonological disorders. Articulation with The Speech Wizard provides speech and language pathologists, parents, caregivers and educators with a fun, interactive, easy to use speech therapy application for children. It offers multiple activities for practicing English phonemes in the initial, medial, and final positions of words at three levels of speech: the word, phrase, and sentence levels. There are over 1000 real-life pictures implemented. Research indicates that child respond better to children’s voice so we felt we had no choice but had to implement a child actress voice recordings for our audio examples for a reference to the users. “As a licensed and practicing Speech-Language Pathologist, I know the value and necessity of auditory training. Auditory discrimination skills with articulation and phonological disorders/delays are so crucial and is why I decided to include two activities just for this important and overlooked area in our Articulation app,” said Shawn Manvell, Founder, The Speech Wizard. “Auditory discrimination skills are the first component to being able to successfully remediate saying a speech sound correctly. The child must be aware and able to listen for their target sound before we should be expecting them to be producing it”. Our “Sound Hunt” and “Find the Sound” make our articulation app unique, as we know and understand the great benefits of auditory discrimination skills with articulation and phonological disorders. Articulation with The Speech Wizard will be available in iTunes in May 2014. Additional information can be found online at http://www.thespeechwizard.com, Facebook, Twitter, and Pinterest. The Speech Wizard is headquartered in Camarillo, California. Copyright @ 2012 The Speech Wizard. All Rights Reserved.